I recently received a copy of Jody Rookstool's book Top 12 Places to Visit in Texas. I've called myself a resident here for the past three and a half years, but it seems like every other day I visit or at least learn about a new place. Hey, this is a big state, after all. Rookstool's book is certainly going to help me add a few pins on my Texas map. I don't actually have a Texas map, but I'm speaking metaphorically here, so let's roll with it. I had only heard of a couple of the locations in this book, so that's a good thing. Lots of hidden gems contained within, like Gorman Falls and Dinosaur Valley State Park. However, there could be a bit more flair to this book–namely, with the inclusion of pictures. 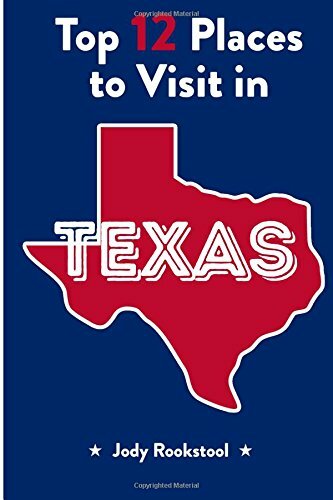 Rookstool herself says "Texas is so rife with locations worth seeing in person that it almost seems criminal to limit the contents of this book to just 12 in total." I'm sure the thinking is that a description and link to more information will cause people to search for more information, while a picture might give them the thought of "eh, I've seen it." But I don't think those kind of people are really the target audience for this book anyway. The descriptions are solid, and there is a lot of good information on each place, but I do feel like this would be more suitable as a blog post or e-book. As it is, it's sort of like a pamphlet to some of Texas's cooler, lesser known locales, just without any maps or photographs. Also, this is just a minor complaint, but the pages don't match up with the glossary. Everything is essentially three pages later than it says in the book. For example, Chapter 1 claims to begin on page three, but it doesn't actually begin until page six. Some people probably won't notice (especially since there are only about 30 pages in the whole thing), though my neurotic sense of noticing little details picked it up. Again, nothing major, but that seems like a bit of an oversight, and might cause readers to think the other information might not be as thorough or accurate as it could be.